The stucco-slathered facade disguises a venerable building and an incredible history. The violent confrontation between gay patrons of the Stonewall Inn on Christopher Street and New York City police on June 28, 1969 is universally recognized as the beginning of the Gay Rights Movement. Yet three years earlier, around the corner in a little bar known as Julius, the first stone in the battle was cast. In 1822 through 1823 a devastating yellow fever epidemic caused New Yorkers with the financial means to do so to flee north to the sleepy hamlet of Greenwich. The little village nestled up to the sprawling, 300-acre country estate built by Sir Peter Warren, now owned by Abraham van Nest. As new residents flocked to the area, the van Nest estate was quickly dissected into building lots. In 1826 a two-and-a-half story Federal-style house and store was constructed at the corner of West 10th Street and Waverly Place. The unimposing house featured a peaked roof with, most likely, one or two dormers. For decades the building at No. 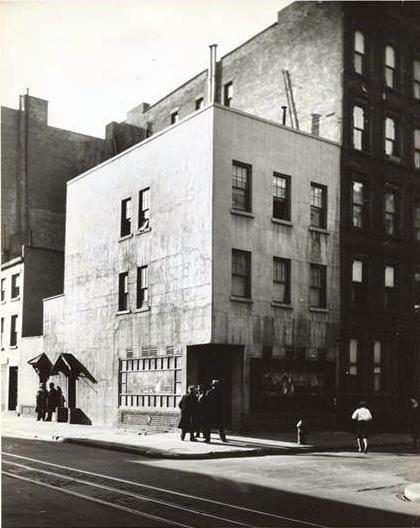 159 West 10th Street was home to a shopkeeper and his family above a grocery store at street level. In March 1865 Carrol C. McConke listed this as his address when he was drafted into the War of Rebellion—later commonly known as the Civil War. Then in 1864, just one year before the end of the war, the store was converted to a tavern. For more than half a century the little corner watering hole sat quietly minding its own business. Then on October 28, 1919 the Volstead Act was enacted to enforce Prohibition. The bar, known as the Seven Doors, shuttered its windows and installed a peep hole—a little hinged panel within the side door—and continued serving alcohol. By now the long wooden bar had gained its unique footrest. A long parade of brass basset hounds marched nose-to-tail below the bar, offering their backs to the shoes of the cigar-smoking patrons. Greenwich Village legend maintains that Johnny Boggiano, a young Italian truck driver, earned enough money transporting illegal beer that he was able to purchase the bar. When Prohibition was repealed, the Seven Doors became “Julius,” although no one is quite sure how the name came about. In the back room, it is said, names like Fats Waller and Billie Holliday sang during the 1930s and ‘40s. And while the bar/restaurant filled with prize-fight and horse racing fans (there are still yellowing photographs behind the bar) and one-time celebrities (signed photos crowd into one another alongside framed newspaper clippings) it also became a favorite of neighborhood homosexuals. Times were different then, however. Patrons like Walter Winchell would no doubt never have guessed that equally-famous names like Tennessee Williams and Truman Capote were looking for male companionship. One story told is that Edward Albee met a young professor of archaeology here in 1966. The man was married to the daughter of the college president and, reportedly, became the inspiration of Who’s Afraid of Virginia Woolf? This was the same year that Julius would change the course of history for American homosexuals. The New York State Liquor Authority forbade the serving of alcohol to disorderly persons. Homosexuals were defined as disorderly and, therefore, it was illegal to serve admitted gays. Patrons suspected of being homosexual could be legally evicted or ordered to face forward to prevent them from making eye contact with other patrons. The photograph and the Times story were all the Mattachine Society needed to take the New York State Liquor Authority to court. The court ruled that homosexuals could not be prevented from peacefully assembling or from being served because of their sexual orientation. Because of the ruling Julius rightfully dubbed itself the oldest gay bar in New York City. Julius was featured prominently in the 1970 film, The Boys in the Band, and again in 1976 in Next Stop, Greenwich Village. The sawdust on the floor, the tables and stools made from beer kegs and barrels from the Jacob Ruppert Brewery, and the years of accumulated dust on the lighting fixtures made time seem to stand still in the old bar. Then, towards the end of the 20th century, the building, altered to a full three floors, showed its age. The façade, which had been stuccoed over early in the century, showed huge, threatening cracks. Immense wooden beams were brought in to prop up the ceiling and the structure was shored up on the outside. The 19th century bar, the brass basset hound foot rail, and the myriad photographs, clippings and other memorabilia that constituted a Julius time capsule were removed. After months of restoration, the structure was stabilized. Everything was returned—except the sawdust and the dust—and replaced exactly as it had been. Today Julius sits quietly on its Greenwich Village corner peacefully away from the busier streets. Having made its 1966 contribution to gay rights history, it returned its preferred role: a neighborhood bar. Thank you! At last, a history of Julius! While it is uncertain that there was actually live music there, in the '30s and '40s it was a stopover for many of the figures in the Village jazz scene at the time, particularly since the jazz club Nick's was just around the corner. 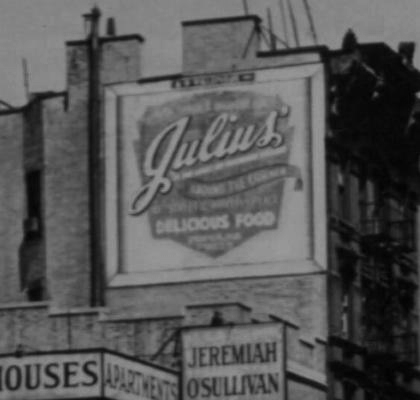 Julius is unique; a symbol of a particular era of Greenwich Village and gay history that has all but evaporated. NYU Violet and Julius "perfect together".